French parliamentarians have approved a non-binding resolution today asking for the lifting of EU sanctions imposed on Russia, allegedly for its role in Ukraine. The lower house of the French Parliament has voted against the sanctions by 55 to 44. In favor of the resolution have voted parliamentarians from the center-right, the right and the radical left. The Hollande government has recommended the rejection of the proposal to lift sanctions. Against the proposal have voted Socialist and Green deputies. Both parties and the mainstream media in France are extremely hostile to Russia, as never before in French history! France was traditionally a pillar of European independence. It has opposed the Vietnam war and, more recently, the invasion of Iraq and had left the military wing of the Atlantic Alliance. But, after the election of Sarkozy as President and also under Hollande, it not only returned fully to NATO, it became the privileged “actor” of neoconservatives in Europe. Paris has played a critical role in the “humanitarian” interventions which destroyed Syria and Libya and are directly responsible for the flow of millions of refugees to Europe and for the development of the Islamic State. But now Sarkozy, under the pressure of the rise of Le Pen and trying to reconstruct the once gaulliste French right, tries to make some corrections to his unconditional siding with Washington on international policy. The vote in France comes only weeks after the Dutch voters have put also into question western policy towards Russia, by rejecting the EU-Ukraine agreement. It comes also at the worse moment for President Hollande who faces strong social opposition in France and, according to most observers, is presiding over his own end – and also the end of an era if not of a regime. Today French police has clashed with and used tear gas against demonstrators protesting the new labour law in several cities including Paris, Nantes, Lyon and Rennes. As you watch, perhaps with alarm, as thousands of refugees from Muslim countries make their way through Europe in a seemingly endless parade, you may be wondering if some of them will end up living near you, and how this might affect your life. 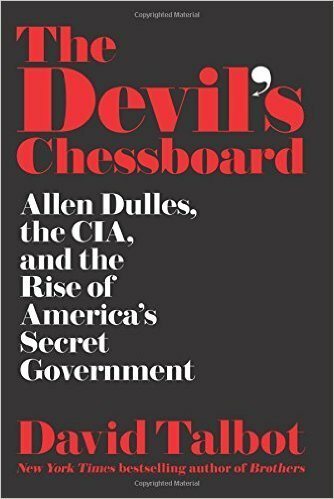 This is the first of a three-part series of excerpts, from Chapter 15 (“Contempt”) of The Devil’s Chessboard: Allen Dulles, the CIA, and the Rise of the American Secret Government. by David Talbot, HarperCollins Publishers, 2015. It was Cuba that created the first fracture between Kennedy and his national security chain of command. But while the Bay of Pigs was still dominating the front pages, the CIA mucked its way into another international crisis that required the president’s urgent attention. The Cuba invasion has all but erased this second crisis from history. But the strange events that occurred in Paris in April 1961 reinforced the disturbing feeling that President Kennedy was not in control of his own government. Paris was in turmoil. At dawn on Saturday morning, April 22, a group of retired French generals had seized power in Algiers to block President Charles de Gaulle from settling the long, bloody war for Algerian independence. Rumors quickly spread that the coup plotters were coming next for de Gaulle himself, and that the skies over Paris would soon be filled with battle-hardened paratroopers and French Foreign Legionnaires from Algeria. Gripped by the dying convulsions of its colonial reign, France braced for a calamitous showdown. After de Gaulle was elected president in 1958, he sought to purge the French government of its CIA-connected elements. Dulles had made heavy inroads into France’s political, cultural, and intelligence circles in the postwar years. The threat to French democracy was actually even more immediate than feared. On Saturday evening, two units of paratroopers totaling over two thousand men huddled in the Forest of Orleans and the Forest of Rambouillet, not much more than an hour outside Paris. The rebellious paratroopers were poised for the final command to join up with tank units from Rambouillet and converge on the capital, with the aim of seizing the Élysée Palace and other key government posts. By Sunday, panic was sweeping through Paris. All air traffic was halted over the area, the Metro was shut down, and cinemas were dark. Only the cafés remained open, where Parisians crowded anxiously to swap the latest gossip. A Great Example for Today’s Europe! March 10, 1966: After 31 assassination attempts against his life, Charles De Gaulle ordered France’s withdrawal from NATO’s military integrated command. This decision was formally reversed almost half a century later under Nicolas Sarkozy’s presidency. De Gaulle adopted a foreign policy independent of the Anglo-american axis. His March 10 1966, not only pertained France’s decision to withdraw from NATO’s integrated military command, but also to remove NATO’s headquarters from French territory, thereby leading the establishment of the Alliance’s headquarters in Brussels.